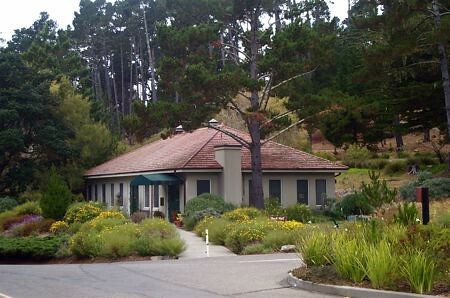 Buck Hall, the main meeting room at Marconi Conference Center, which in the 1970’s had housed one of the Synanon communites. I arrived yesterday at the Marconi Conference Center on Tomales Bay in Western Marin County, some beautiful miles west and north of the Golden Gate Bridge, for the 33rd annual Communal Studies Association Conference, a gathering of mostly academics who research and present papers in this field. A group of academic folk who study communes (and get a little needlework done while listening) attend one of the many presentations at the conference. We were listening to Susan Love Brown talk about a Rastafarian intentional community that flourished in Jamaica in the 1940’s. 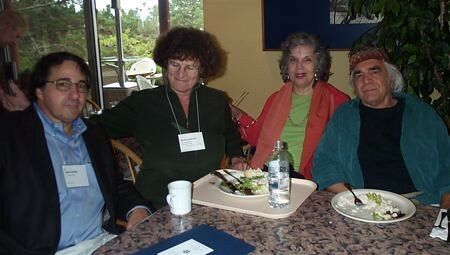 Ramon Sender Barayon (right) and his wife Judith Levy Sender (second from right) at lunch at the conference, along with Ruth Lambach (second from left) and Julius Rubin (left). I guess I should qualify myself, too. I lived at Wheeler Ranch commune, founded Star Mountain commune with the advance from Living on the Earth, lived at Packer Corners Farm commune in Vermont, and wrote the most famous insider’s account of commune life of its time, which is still used as a textbook in college courses on the history and culture of twentieth century utopian communes. Yes, indeed. I belong here, too. Megan Mulet presenting her paper on the gift economy at Burning Man. 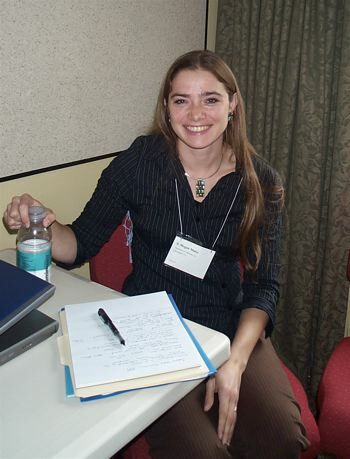 One of the highlights of today’s presentations was by Megan Mulet, a sociologist from UCLA, who has been attending Burning Man the last seven years, and, in the past three, gifted her time as a census taker (her Burner nickname is “The Countess”). She spoke about the benefits of living in a gift-giving economy for those of us living in what she dubbed the “default world,” (she says that’s a Burning Man term), which is more involved in Market Pricing, Equal Exchanges, and/or Priority Status, than in Communal Sharing. I loved presenting my show! 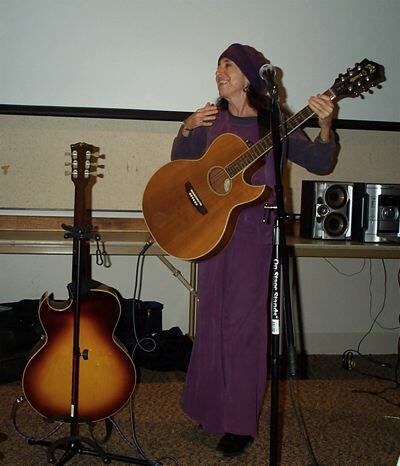 I told stories about my communal life and how Living on the Earth came into being, plus sang songs from all three of my CDs.